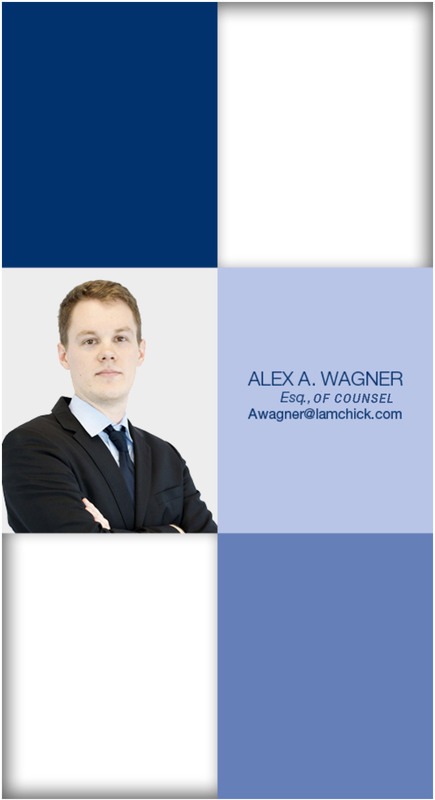 Alex A. Wagner, Esq. is an Associate Attorney focusing in all aspects of Real Estate, Commercial and Foreclosure Litigation, and Landlord/Tenant matters. A long time resident of Wisconsin, Alex attended St. Norbert College where he earned a Bachelor’s of Business Administration. During his time as an undergraduate, Alex was a law clerk intern for the Brown County Circuit Court, working primarily under the Honorable Judges Donald R. Zuidmulder and Mark A. Warpinski (ret.). Alex moved to South Florida to attend and graduate from the University of Miami School of Law. He has been working for the Lamchick Law Group, P.A. since 2012. Alex is a member of the Young Lawyers Division and the Business Law Section of the Florida Bar and is admitted to practice in Florida and the Southern District of Florida.